Join a Mass Experiment in Futurist Speculation with the Game "Superstruct"
The year is 2019, and a report has just come out proving that the Earth's population is likely to suffer catastrophic collapse by the 2040s. Energy costs are rising, a new pandemic called ReDS is devastating the globe, homelessness has reached epic proportions, and the internet has become a miasma of spam that prevents everyone from communicating. Now it's up to you and a few thousand other futurists to save the planet by quickly inventing new social structures that can stop all our civilizational "superthreats" before it's too late. This is just a broad outline of the rewardingly complex plot of a new MMO called Superstruct that the Institute for the Future launched last week. On the game design team are futurist Jamais Cascio (we've got an interview with him below) and celebrated game innovator Jane McGonigal, among many others. They helped shape Superstruct into an experimental game that asks you to do the opposite of what most MMOs do. Instead of inventing a character to play, you have to play yourself — 11 years into the future. Though it launched just last week, Superstruct is already getting raves from mainstream outlets like CBS news, as well as obsessive gamer sites like ARGNet. As much an experiment with futurism as it is an engrossing game, Superstruct is designed to teach people to prepare for a worse future — and to come up with realistic ways to fix it. Each player must do a series of tasks, beginning with a detailed description of what you think you'll be doing in 11 years and ending by working with other players to create new social/political/economic superstructures that could save the world before the 2040s collapse. In the process, you'll read news headlines about the future world, immerse yourself in the life stories of your future neighbors, and participate in detailed world-building with thousands of other players. Your tools will be familiar: blogs, wikis, websites. And you'll gain points by completing tasks, as well as earning "raves" from your fellow players. Superstruct will only last six weeks, but you still have plenty of time to sign up and join the serious fun. Essentially, the game is an act of collective world-building with a specific, ethical purpose in mind. We recently had a chance to talk about this purpose with one of the game's creators, Jamais Cascio, a futurist and writer. Here's what he told us. It seems as if Superstruct came along at the right time, when the globe is in the middle of a massive crisis and governments are reevaluating what to do in the future. After 9/11, interest in the market for foresight thinking collapsed. Companies went out of business, and I didn't get any work doing this stuff for over a year. Nobody wanted to think about the future. But this time, with a bigger crisis, the financial crisis, thinking about future is what a lot of people want to do. Superstruct hit at the right time. A population is out there who want to think about future but don't have a lot of practice at it. A lot of people think the future is too big to think about and it doesn't matter if they think about it anyway. We're trying to say that your choices do matter, even the small choices you make in daily life – everything we do casts a shadow into the future. So in the future you've created for 2019, we're dealing with what you call superthreats. This isn't a happy world. It's important to remember that the five superthreats aren't five separate futures. They're five overlapping crises. Like today's financial crisis overlaps with the war in Iraq, and with AIDS, and the election. All these things you can look at in narrow silos and look at as overlapping. Why didn't you offer the possibility of a happy future where we've made the right choices? Right now I'm working on a section of the game called 21st Century Ideas, which is a page where we talk about the toolkit of solutions [to the superthreats]. We chose to start by focusing on the negative aspects of the foresight experience because [the game] is following a dramatic arc. When you go to the movies and see an adventure it usually stars with the bad stuff before you see the heroic team put together a solution. If you start with all the great stuff, then go to the crisis, you don't really see the crisis at all. It seems like it's already been solved. There was an early consensus among the design team that we needed to give players a sense of terror and fear, and a sense of hope that it can be changed. We're not saying, "Here's the rock slamming into planet — it's too late." We're saying collapse is not inevitable. This is not the singularity or the rapture. Did any science fiction stories influence the world you created for Superstruct? I can tell you that one movie that influenced my thinking about how this world looks and feels is Children of Men. There's a short subject on DVD that talks about how they developed their [near future] scenario, and that's what we did too. We were world building. Setting aside narrow plot, think about how that world in Children of Men looks – that was what came to mind immediately. The US in Superstruct's 2019 has that look of being advanced but exhausted. It's important to remember that we are not doing prediction, here. The Superstruct world that we built is not our or IFTF's vision of what 2019 will look like. It's not about us telling you what will happen, but you running through a scenario and figuring out if this world is where you want to go. It's also about clarifying and demystifying capacities for changing the world. Everybody in the game has to choose a superthreat to focus on. What's the most popular superthreat so far? Outlaw Planet [the world of information scams, surveillance, and data overload] seems to be most popular. Even if this game is nothing like World of Warcraft, I think we have a wave of people who were conversant in that world who picked it. Of the 5 it's also the one that seems to be the least depressing. The others would clearly make people's lives miserable: starvation, lack of health care and housing. Outlaw Planet, at least superficially, is about making people's lives annoying. The threat is more about how easy it is to endanger the sinews and communication networks of society. What are some of your favorite creations you've seen in the game from participants? People are making interesting videos and flickr streams of photoshopped 2019 images [many of which we've used to illustrate this post]. One person is gathering air samples from around the world — sending a jar around, having people open it and send it back. It's metaphorical rather than scientific, but it's about creativity in the creation of artifacts. There is a lot of artifact creation going on here. Many people have set up websites for organizations that will exist in 2019. There's definitely a strong scifi narrative aspect to this, but it's more like a game than a novel because we're creating the board where people play. There's no lead story running through. The parallel here would be scenario books, a module in an RPG. that's a better analogy than you might think because IFTF is planning to spin out the process to other areas. Businesses and organizations will use this same platform as a collaborative idea testing process. When people are asked to describe their future selves, which is the first task in the game, did you find people were inventing fantasy futures for themselves or were trying to be honest and realistic? I was expecting scifi exaggeration and wish-fulfillment. But most people seem to be thinking seriously about what they would be like in this world. Some of the most powerful have been focused on little stories, family stories. One person wrote about how they would tell their kids they only have 23 years left. That's a big question. For me, the notion of telling someone, “Here are the constraints and challenges you'll face,” is the first step to thinking about what you can do about it. You're not just saying, "The world is ending — good luck.” That would be unethical. I think a lot about being an ethical futurist and I think it has to do with making clear the responsibilities people have. And that's what we hope to do with Superstruct. We want to say, "This is in your hands." Ignoring that is also making a choice. Post-industrial building via Mita. 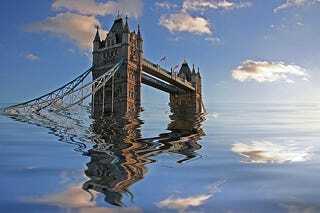 Thames rising via Elaine Alhadeff. Condo boom via reBang2019. ReDS poster via lhall.